Patter is a realtime / freeform generative music system for Ableton Live. Some may prefer watching the 3-part / 17-minute Patter tutorial on YouTube. 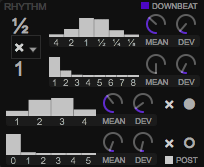 Patter generates MIDI patterns one segment at a time. A segment is a rhythmic grouping of notes. …where the notes (and rests) within each segment are always of equal duration. The bars represent a normal distribution of random numbers from low to high. The mean shifts the probability from low to high (meaning based on context). The deviation expands the probability that the generated number will fall further from the mean. Broadly, Patter has two types of controls: phrasing (left), and gestural (right). Phrasing determines when a Patter device starts and stops, relative to other Patters. 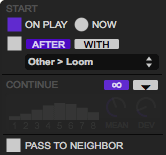 if pass to neighbor is checked, when this Patter is done, randomly select an adjacent Patter and play it (NOTE: Patters must be in the same MIDI Effects Rack!). The Viewer displays generated segments, one at a time, as Patter only generates one segment at a time. When Loop is enabled, previously generated segments are repeated, and highlighted in the loop display as they are being output. Rhythm determines the rhythmic structure of each new segment. e.g. multiplying by 3 yields "dotted" notes, dividing by 3 yields "triplets"
The Accent generator determines where the "accent" (highest velocity) is placed in the segment—earlier or later. Actual velocity values are hard-coded to 128 (accented) versus 64 (unaccented). The Pitch region sets the pitch of each note in each segment. if Live is selected, all notes will be unselected, and only re-selected when a key is pressed in MIDI input. Careful! If Live is selected and no notes are pressed, any MIDI pitch may be played. When a segment parameter is edited, the viewer will display a preview of a possible resulting segment (assuming deviation of all controls is zero). Patter devices may be nested in any number of racks for organization or storage purposes.